Everyone has a story: the man walking the crosswalk, the lady who stops to chat in the grocery store, your mom... This space is for us to connect with community and share stories. Connecting with those we admire, hearing the trials & triumphs, empowering each other and maybe coming away with a thought you hadn't looked at before or maybe one to revisit. I met Danielle DeCarr in 6th grade! (she's one of my best friends) and so it's not surprising that I admire her and want to feature her ;) Danielle has an Interior Decorating business and has a thing or two to teach us and talk about her journey as an independent business owner. How did your journey start and what is your background? My whole life I have enjoyed interior decorating. When I was younger my mom would catch me moving furniture around the house... she would keep it and tell me she loved what I had done. My mom always had a good eye for design and always cared about the decor within the house, so I think that is where I got my passion from. I went to college at the University of Arizona and received my bachelors degree in communication. Since the University of Arizona didn't have an interior design program I decided to join a program in Newport, CA called Newport Institute of Interior Design where I received my interior design certification. My first interior design job was in Huntington Beach as an assistant to a designer. After that I went to the South Bay and worked with two different women and learned so much about interior design with an emphasis on high end homes. I was so fascinated by about how much money people were willing to spend on design, high end fabrics, and decor. It was incredible. I was learning and absorbing everything that these women did and putting it into the back of my mind to eventually use one day when I started my own company. What was your first independent job? I was hired by my sister for my first independent job. She is a dentist and was opening up her very own practice and she allowed me to do whatever I wanted within the space. I was able to create this high anxiety room for patients with essential oil diffusers, changing color candles, big comfy chairs, and it almost feels like you just walked into a spa. All patients receive a lavender towel after their services and with design we were able to turn a scary dentist office into a complete spa experience. Where do interior designers shop? Interior designers do have the ability to shop at some exclusive stores that are meant only for approved designers which is great for a competitive advantage over other designers, but it depends on what and who you are shopping. Some local shops will work just as well for all your interior design needs. What are some tips that you can give the readers on interior design? Keeping the structural stuff that is going to be there for a long time light and bright. Light and bright will never go out of style. You want a home to be open and airy and not dark and closed. I design with light and neutral tones in mind, then where you play is with the fabrics and accessories. This is where you can add the color because then it is easy to change those accessories as the trends and your style changes over time. Casa Laguna Hotel is a place that inspires you, why? Spanish colonial design is something that I love! My inspiration actually came from the La Quinta Resort and Spa outside of palm desert where my family and I would take summer vacations. I wanted to find a place in Orange County that represented that. I love the white stucco, beautiful tiles, and the colonial style of the Casa Laguna Hotel and it gives me that same feeling as La Quinta. Its this old feeling I get when I'm around Spanish influenced architecture and sometimes I think that in a past lifetime I was somewhere in a Colonial Spanish Village. Why are you attracted to the Spanish colonial style? Where is somewhere you are wanting to travel to? I would love to go to Greece to see their famous architecture with the beautiful white and blue buildings. I enjoy any type of physical fitness but my newest passion right now is pilates. Its very motivating for me with the exercises that helps build the connections between your mind and body. The reformer class is one of my favorites which focuses on your breath and toning your core muscles. What do you love about traveling? I love traveling because it gives you the opportunity to discover another side of yourself along with seeing new places and meeting new people. There is so much self discovery that can happen and it is truly amazing. Also, finding someone that understands the love for travel and being able to do with them is special. Was there one specific country that you loved? My favorite country that I have been to is Australia. I went to Sydney which is an amazing city right on the water. Their culture screams good vibes and the people are great. Hamilton Island was one of my favorite places I went. Everyone drives golf carts around because there are no cars allowed on the island, and then from there you can go and see the Great Barrier Reef. Australia is a country that has a lot of active and adventurous experiences and I would highly recommend going there to any traveler. What is something you cant live without when you travel? 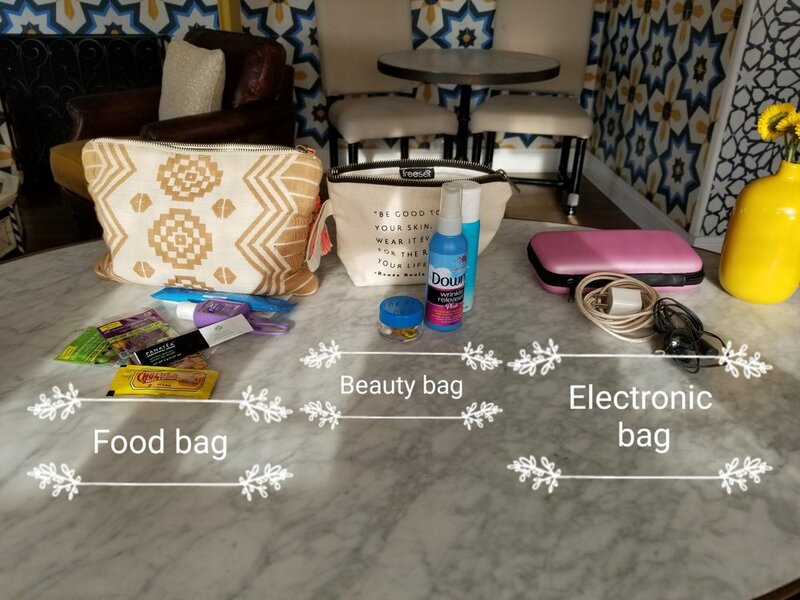 My travel size bags 😉 I have an electronics bag, a beauty bag, and am food bag that I take everywhere with me when I travel. These bags will help bring you a sense of home to your travel ventures. My electronics bag has my headphones, and all my chargers. My beauty bag has hand sanitizer, a tooth brush, dry shampoo, de-wrinkle spray, vitamins, and of course essential oils. My food bag has my snacks that I normally eat at home and I always bring my favorite teas. I also keep a notebook with me for ideas and brainstorming while on the plane and embrace the alone time I get with no wifi. Try to think of what you need in your daily life outside of travel and try to incorporate that into your travel life. This will allow you to bring yourself into your travels and make you feel like you're apart of the life as well. You should still take care of yourself and keep some of your routine from home.